As the popularity of the Jeep TJ has raged forward, so have the requests to perform the most exciting and practical of all engine swaps to them: Chevrolet & GM power! These conversions take some basic planning and effort in their execution, but the results can be quite fantastic. With improvements in power, fuel economy, reliability and broad range driveability, once one has driven a TJ with a proper GM V8 conversion, it's too hard to look back. Even the Chevy V6 motors offer significant upgrades from even the best tuned and built factory engine options. 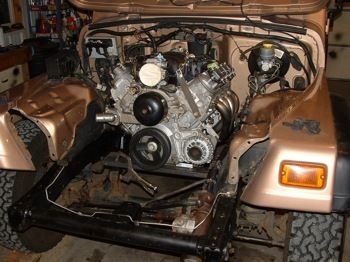 Read Novak's detailed TJ conversion instruction package as provided with our engine mounts. With the spirit of the Jeep Universal Truck still very much intact, the Jeep TJ has done Jeep aficionados generally proud by retaining its off road heritage, and doing so with a touch more panache and refinement than ever before. The Jeep TJ Wrangler was introduced in 1997 after skipping a model year after the 1995 YJ. Body & Suspension Lift Required? One of the most significant myths being perpetuated is that the TJ requires a body and/or suspension lift for a successful GM conversion. Our and our customers experiences run absolutely counter to this. If the engine and transmission installation is done wrong, then such measures may have to be taken, but it is a bandage and probably not sanitary work. It is back to round headlights with the TJ, but much more than that. A very major redesign - even more so than from the CJ to the YJ - the TJ got some dramatic changes that include a full coil and track arm suspension system, a low profile hood, and a more refined interior. However, what changed little was the powertrain. From the axles to the engine, the TJ relied on the same systems as were found in its YJ predecessor, which makes for an easier engine conversion than one might expect. The TJ Jeep featured three engine options. The Powertech 2.5L four-cylinder returned in the Jeep TJ, carrying its 1984 AMC heritage though with horsepower tweaked up slightly. The 4.0L of previous Jeeps returned to the TJ with its Mopar engine management system. Fuel economy for the best rendition of the TJ 4.0L I6 is 15 city/18 highway MPG. 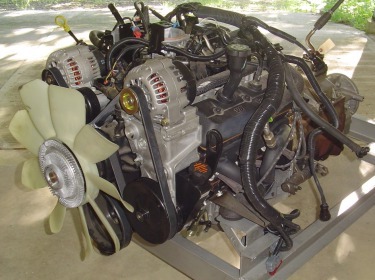 The AMC 2.5L engine was replaced in the Jeep TJ with the Mopar 2.4L engine in 2004. This engine was originally developed for release in 1994 Chrysler small van and car products. This aluminum head, DOHC engine features a different bellhousing bolt pattern than the previous 2.5L. Six transmissions are available for the Jeep TJ. Customer J.Brink shows the beginning stages of positioning the motor. The GM V8 fits like a glove. The AX5 five-speed manual transmission is standard with the 2.5L four-cylinder engine throughout the span of the TJ's production. This transmission is light-duty. They are known to fail even behind the anemic 2.5 I4. We neither recommend nor make any conversion to retain this transmission. The automatic transmission available with the 2.5L through is the Torqueflite TF904. This transmission has a better history than the AX5, but we still recommend replacing it when upgrading to any motor that is significantly stronger. These gearboxes that were available with the 2.5L are rated and proven as light-duty. From 1997 the AX15 is the five-speed manual transmission as carried over from the Jeep YJ. 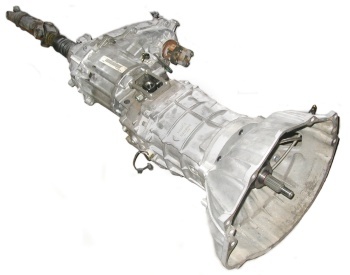 This medium-duty gearbox remained as the standard shift transmission in the six-cylinder Wrangler through 1999. For the 2000 model year, Jeep introduced the NV3550 five-speed manual as a replacement for the AX15. It is similar in appearance, strength and compatibility. The automatics for the six-cylinder TJ is primarily the 32RH. These transmissions are adequate, but nothing to get too excited about, especially in comparison to the GM automatic transmissions. GM automatics are superior enough that it is a clear choice to make one of them part of the swap, and adapt them to the very worthwhile Jeep transfer cases. The TJ inherited the NP-231 or the New Venture Gear NVG 231) part-time transfer case from the YJ line. This transfer case is the de facto reliable transfer case with all four and six-cylinder TJ's throughout their span. With the introduction of the TJ Rubicon, we discovered the NP241OR transfer case. This version is even stronger than the 231 and sports a 4:1 low-range. Both transfer cases are fully adaptable to GM conversion transmissions and each has the strength to very well transfer V8 power. We encourage your additional reading about your transfer case, by following the above links. In the entire production run of the TJ Jeep, all transmissions except two should be ruled out when performing a GM engine swap. These include the AX5 and 904 / 30RH transmissions, which were hardly durable behind the lackluster factory engines. GM power can spell their demise within days to weeks. The AX15 and NV3550 manual transmissions, however, can be successfully retained in a GM engine conversion. Details, below. TH350: Swappers should surely consider the GM TH350 automatic. The Turbo 350 is strong, compact, widely available and affordable to buy, service and build. • The NP231 & NP241OR transfer cases are adaptable to the TH350 by using our #131 series adapter kits. TH700R4: As the TH350 lacks overdrive, many installers will opt for the GM TH700R-4 automatic. The Turbo 700R4 transmission has taken the conversion world by storm and is a good option for the same reasons as the TH350, with advantages in having both a lower first gear and a .75:1 overdrive. Additionally, it is the transmission often coupled with many of the GM TBI & TPI V6 & V8 engines that are the prime candidates for Jeep swaps. Note that there are 60 deg. (2.8L, 3.1L, 3.4L & 3800) and 90 deg. (Small Block V6/V8) versions of the 700R4, though the latter is far more common. • The NP231 & NP241OR transfer cases are adaptable to the TH700R4 by using our #171 series adapter kits. 4L60-E: The new and most refined version of the 700R4 is the 4L60E, and is a great candidate as well, especially when installed with a Gen. III GM engine and PCM (Powertrain Control Module). • The NP231 & NP241 transfer cases are adaptable to the 4L60-E by using our #4L61 series adapter kits. TH400: In the no-holds-barred strength category, the TH400 may be the obvious automatic of choice. Though more intended for those towing or getting into some rowdier off-roading, the Turbo 400 can be a good option. • The NP231 & NP241OR transfer cases are adaptable to the TH400 by using our #141 series adapter kits. No adapters are generally needed to marry the above transmissions to their usually matching Chevrolet engines. 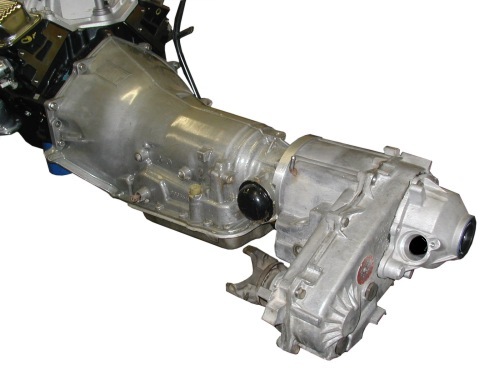 A TH350 automatic that is very easily and compactly joined to the Jeep transfer case. Novak's #SK2X transfer case shifter assembly tops it off. A Ram Jet 350, TH700R4 and Jeep NP231 - loaded and ready for a home between the Jeep's frame rails. The entire assembly can actually be loaded through the engine bay if manipulated carefully. The larger portion of TJ's were equipped with manual transmissions with the remainder featuring automatics. If converting from automatic to manual in conjunction with your engine swap, note that the installation of the OEM clutch pedal, master cylinder and related components is not difficult as the provisions to do so are already in place. We will recommend the use of our #HCR3 Hydraulic Slave Cylinder Retrofit assembly on a Chevrolet bellhousing, as it is fully compatible with Chevy engines and the transmissions discussed below. AX15: If your Jeep happens to have the AX15 five-speed transmission, you may choose to retain with your GM engine conversion. Though not suited for wild V8 power or punishing off-roading, mild V8's and V6's and all around trail use make the AX15 good match. 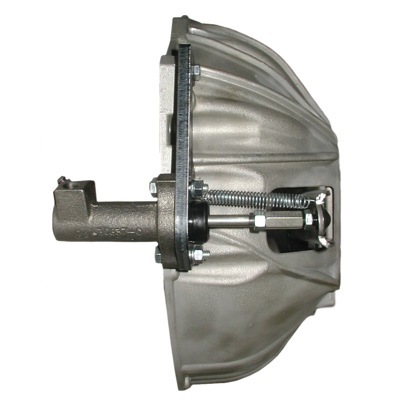 Adaptability is not difficult, and is accommodated by our #GMAX series adapter assemblies with the use of your existing GM Muncie/Saginaw style bellhousing. Its overdrive feature can be useful. NV3550: The NV3550 is a pretty tough transmission and can be married to GM power. Adaptability is not difficult, and is accommodated by our #GMAX series adapter assemblies with the use of your existing GM Muncie/Saginaw style bellhousing. Its overdrive feature can be useful. Many TJ's are destined for more hybrid or even hard trail use and some individuals will be choosing manual shift, heavy-duty truck four speeds to place behind their GM powerplants. SM420: For the old-school, ultra low geared crowd, the SM420 four-speed manual transmission is a great choice. Surprisingly well behaved on-road and absolutely burley off-road, the SM420 is a cool box of gears. If you think a transmission designed in the 1940's is an anachronism, you are right, and a very neat one at that. 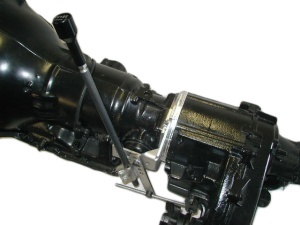 Be aware that this transmission shifter sits significantly further forward than the factory manual transmissions. 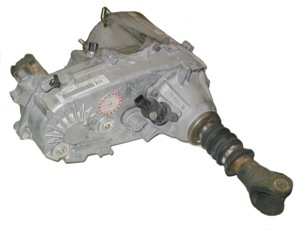 Console removal or modification and ABS computer relocation is likely necessary when using this transmission. • The NP231 & NP241OR transfer cases are adaptable to the SM420 by using our #421 series adapter kits. SM465: Newer and a bit more refined than the SM420 is the SM465, for an only slightly less low geared transmission. They are easy to find and work with. • The NP231 & NP241OR transfer cases are adaptable to the SM465 by using our #461 series adapter kits. The Chevrolet bellhousing, Jeep AX-15 and Jeep NP231 transfer case married together and ready to lift into the Jeep's tunnel. The NP231 transfer case is strong, versatile and your TJ likely already has one. The Jeep NP231 is very commonly retained in GM conversions because of its compact nature, strength, broad array of aftermarket parts and the extreme compactness of the adapters that marry it to the conversion transmissions. We don't even need to make a case for keeping the Rubicon's NP241. It is easily retained and adapted to the conversion upgrade transmissions in the same manner as the NP231. Some attempt to install the similar Chevy NP231C or NP233C but find that the long factory adapters and significant lack of upgrade parts (especially heavy-duty short tailshafts) for these transfer cases makes them unattractive choices. There exists an additional issue of speed sensor compatibility, where the Jeep speedometer requires the particular signal as generated by the Jeep transfer case output. This is where the planning gets most interesting and the decisions most subjective. The very first decision to be made here involves this: what kind of power do you need to do what you want with your Wrangler? 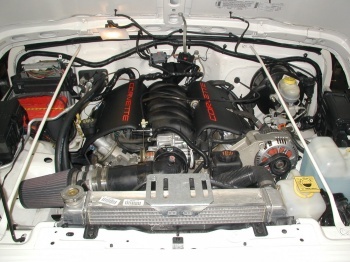 Now, a precursor to the rest of this section: If you got past the title of this article and are hell-bent on a non-GM engine, know that conversions this important are not walks in the park and GM engine swaps are almost invariably easier, more productive and more affordable than Dodge, Ford and other conversions. These companies make some great engines, but you have to pick your battles when doing a swap and going with a well supported, well documented, easily acquired and broadly familiar powertrain is a key to success and satisfaction. The second most common error swappers make is to convert to an engine that is too large, from both size and displacement, for the vehicle. While a Small Block V8 is a great engine, there are sometimes better choices for smaller Jeeps, such as Buick and Chevrolet V6's, etc. Remember that you are dealing with a 3100lb. vehicle. This, by all standards, is light, and that is one reason why these vehicles prove to be the most agile in the world. Adding an overburdening block of iron to smaller Jeeps will give disappointing results in terms of handling, braking and of course, breaking – of several components directly and indirectly between the block and the vehicle. Besides, fit into the engine bay is usually so poor that the work soon looks as poorly as it was thought out in such situations. You're surely not doing the swap to go with a pansy powerplant, but do you need a V8? We'll help you rule out two extremes. Don't swap an engine in with any fewer than 3.8L and don't swap one in with any more than 400 c.i. Big Block engines are out. They do not fit and they could generate more power than the Jeep may be able to contain. We get an occasional call from customers that have found a beautiful Vortec V8 and ask if they can put a "simpler" carburetor on it. This has every distinct disadvantage that we can think of: increased parts cost, decreased efficiency, driveability and reliability. Don't even think about it. Fuel injection (especially GM fuel injection) is much easier to work with than too many people think. Note that there are two emission systems to consider: Exhaust and Evaporative. The former consists of burning (and reburning) the fuel and air to the cleanest state possible, and then reburning yet again through the catalytic converter in the exhaust circuit. Evaporative emissions consist of how the unburned fuel is stored and transferred in the vehicle. The principal piece of hardware used here is a charcoal canister that absorbs fuel fumes as they slowly evaporate from the tank and lines. Upon starting the engine, the cannister is purged of these fumes through engine vacuum and the temporary opening of a purge valve. Usually, one should retain the Jeep's existing canister as it already fits, and evaporative emissions management are no different for the engines involved. Your Jeep is considered to be a “Light Truck” by most jurisdictions. As such, you can usually source your engine from a GM truck or SUV without failing your emissions certification. However, this again is according to local laws and your research is encouraged. Car engines do burn cleaner and may be more affordable as well. 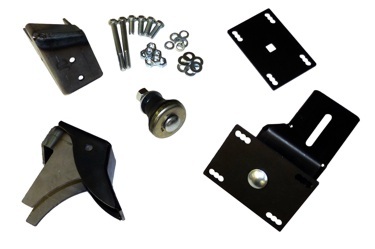 The accessory package and its brackets. The latter is especially important in that you don't want to waste valuable time and money chasing down the bracketry. The three major GM accessories that are native to the engine that you will install into your Jeep are the alternator, power steering pump and perhaps the air conditioner pump. The powertrain wiring harness. This is where individuals get unnecessarily uptight. This harness is quite obvious and surprisingly well self-contained. You will want all circuits to the engine's sensors and controllers, and you may opt to include the GM Power Distribution Center, also known as the relay center. The automatic transmission that is married to the engine. It is very helpful to keep your (usually) 4L60-E transmission attached to its engine and computer. As a matched set, your installation will usually be simpler. A Novak customer's Vortec V6 engine cleanly extracted and ready for installation. The wiring harness is complete and ready to plug into the computer. Firewall clearance; a general rule is to leave yourself enough room that you can service the points at the rear of the engine without the removal of the engine from the Jeep. 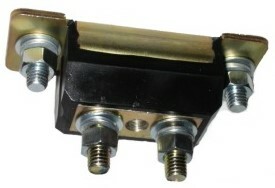 This includes any distributor, plugs, manifolds or other sub-systems. Note here that the Cherokee has an indentation just off of center in the firewall for clearance with the factory I4 & I6 engine heads and valve covers. This is a very handy place to tuck a Chevy HEI V6/V8 distributor. Denting and especially cutting of the firewall looks quite terrible and will take away from the great look of your new engine. Frame rail clearance; it is usually exhaust manifolds that dictate location here. Most TJ installations will require the engine to be centered, or even offset 1/2" to 1" towards the passenger side. Hood clearance; will the hood close without any (remember that engines twist under torque) interference? Choice of air cleaner and air induction tubing is also an issue here. The TJ actually has a generous engine bay height envelope but you should still avoid mounting the engine too high for the sake of tunnel-to-transmission clearance and overall center of gravity. Front axle clearance; will your your axle, at maximum compression, threaten your oil pan? Most GM engines have rear sump pans so this should not be difficult. Customer A.A. Ashram shows us the second most exciting step of the conversion process - the most exciting being the first drive. It will be little news to most readers that the factory radiator will not work with a conversion engine both in terms of cooling capacity and outlet location. Novak started swapping V8 engines into TJ Jeeps a few years ago and setting up a cooling system was a stifling challenge. 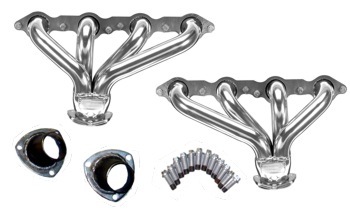 Since then we now offer a bolt-in performance aluminum radiator with the outlets already configured for GM power. See our Cooling Components section to view the line-up. The PCM is an enclosed industrial-grade computer that, like most computers, has a processor, memory and IO connections. Newer PCM’s use an EEPROM chip; they are Electrically Erasable. This is also called flash ROM, and some users will equate this to the BIOS chip on their PC computer motherboard. The computer works on if/then data tables and mathematical formulas in the ROM to interpret data streaming in from engine and vehicle sensors, including speed, temperature, exhaust O2, intake air flow, throttle position, crankshaft/cam position, brake, etc. The culmination of these data is processed to provide optimum fuel/spark delivery and in many cases, automatic transmission shifting points. Speed and rev limiters are also incorporated into some units. 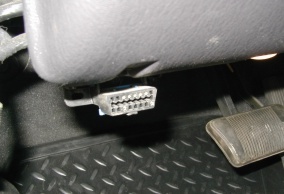 Once called an Engine Control Module (ECM), these computers have been appearing in vehicles since the early to mid-eighties. Their initial functions leaned more towards carburetor control primarily to keep up with tightening emissions standards. This was a bit of a dark time in automotive systems engineering as these early systems are now mistrusted to a degree by owner and mechanic alike. Modern PCM's have evolved to be highly reliable, very functional and it is not difficult to integrate them into the Jeep engine bay with your new motor. Some installations require PCM reprogramming. This is a service that is much more available for GM computers than any other, often through GM dealers, or local and national tuning shops. This is the Jeep's (1996 & later) OBDII DLC data plug, compatible with any onboard diagnostic reader. Your choosing of a 1996 or later Chevrolet or GM engine will allow you to connect this port to your GM computer. We are amused by companies claims and inferences that the installation of Dodge V8 engines only allows retention of this feature or the "factory serviceable" status. Any shop (or home mechanic with a DLC reader) worth its salt can service and diagnose your GM engine in your Jeep's bay, and likely with greater ease and flexibility than with any other powerplant available. Some view the electrical and wiring aspects of a conversion as the 800 lb. gorilla of the swap. In fact, it is seldom as difficult as perceived, especially when working with GM power. At the most fundamental level, whether you are working with a carbureted, throttle body injected or multi-point ("tuned port") injected engine, you will retain and connect the original GM alternator in the same manner as was the Jeep alternator; the same for the distributor, etc. From basic (TBI) to advanced (TPI & Gen. III) injection systems, the swaps are still largely the same. The installer should keep one simple principle in mind: make the engine think it is running in its original GM chassis. A simplistic but fair summary would state that a 1955 Chevy 283 and a 2004 LS1 have the same basic wiring requirements; power to the starter when it is required, power to the distributor (or coils) when needed. The battery needs power from the alternator to keep it charged. An installer's analysis of the Jeep's particular wiring diagram and the engine's wiring diagram will quickly reveal the wires that can be merged, connected and (in many cases) simplified or even eliminated. In 1996, coupled with the advent of the OBD-II standard, Jeep also introduced a fully electronic gauge cluster. The six gauges have one integrated microprocessor that receives a multiplexed signal from the PCM. This digital signal cannot be generated without the Jeep computer. There are two ways to get around this: the first and best is to upgrade the Jeep cluster to an aftermarket set that is fully GM compatible. The fuel level meter should be Chrysler compatible since you will be using the signal from the factory fuel sender. In the end, this may be a better method due to the accuracy, adjustability (especially important for the speedometer on Jeeps with varying tire sizes and axle ratios) and custom look. Customer R.Olsen shows us how to make an aftermarket gauge cluster in style with his 5.3L Vortec powered TJ Jeep. The second (preferred) way to circumvent this challenge is to run the Jeep computer (ECM) in tandem with the GM powertrain computer. This consists of applying source voltage to the Jeep unit and then feeding the varying (oil pressure, water temp, voltage, etc.) signals into it to be processed and multiplexed to the original gauge panel. The tachometer can now be rendered operational by using the Novak Crank Position Emulator module. Installers will be pleased to hear that steering need change none or very little to perform the engine conversion. You will use a GM power steering pump and its bracketry that is usually native to the engine being installed. 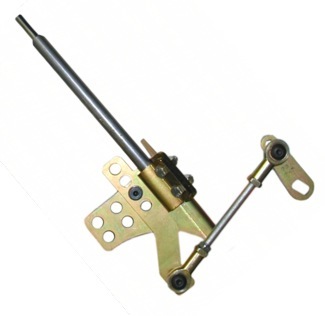 Not all brackets place the pump in the most friendly position vis a vis the steering shaft. If in doubt, the Camaro style brackets usually fit the best in these and many other Jeeps. Novak's new bolt-in engine mounts for TJ's represent a tradition of innovation, strength, ease of installation and superior clearances for steering and exhaust systems. Chevy 4.3L V6, 425 lbs. Chevy Small Block V8 (Gen. I & II), 550 lbs. GM Gen. III V8 (iron block), 470 lbs. GM Gen. III V8 (aluminum block), 407 lbs. Buick 90 degree V6, 375 lbs. Factory springs are usually great for most Small Block V6 and V8 engines. We have replaced four-cylinder Jeep engines with V8's and noticed no sag or overly soft ride in the front axle. Aftermarket springs usually make no distinction and are rated well for most engines this side of Big Blocks. Lift is not required for the Jeep TJ to perform the engine swap, but may be done for reasons external to the swap. A 1999 TJ Wrangler with a 5.7L LS1 Chevrolet V8 as sourced from a Corvette. At 400HP, and as much torque across a broad RPM range, it had the impressive ability to plant the driver deeply into the seat. This was our first LS1 to TJ swap a few years ago and what was so challenging then has become second nature and we documented. Fuel economy was up five points from the 4.0L I6 that it replaced. Fuel pumps have evolved from low pressure (4-12 PSI) mechanical, engine mounted units for carburetors - good at pulling fuel over a distance - to medium pressure (13-18 PSI), electric in-tank pumps for throttle body engines, to high pressure, electric, in-tank pumps. These latter pumps are designed to push fuel, not pull it, and at pressures ranging from 38-65 PSI for multi-point injections systems. Additionally, with the higher temperatures that these high-pressure pumps generate, their immersion into the cooler fuel is critical for the durability of its electric motor. External pumps of the same ratings are available and are self-cooled by being built into heat dissipating aluminum housings. For 1997-2004 TJ's, Novak offers its #FSK-9704 fuel system integration kit to simplify this procedure for these in-tank regulated Jeeps. 2005-2006 TJ's and LJ's feature a native ~60 PSI system and no changes are necessary. The installer must run a header that is tight fitting. The shorty, block-hugging style is the best bet. This is one way to run the exhaust circuit. You may also run the cross-circuit under the bellhousing. Work closely with your exhaust specialist in coming up with a system that will not detract from the serviceability of other parts under your Jeep, and maintain heat, ground and other working clearances. While the TJ has a relatively narrow window in which to run pipes, and a transfer case to dodge as well, you can run dual exhaust. However, we suggest running the driver's side exhaust circuit under the rear wall of the oil pan and in front of the transmission / bellhousing face, into a Y-pipe joining it with the passenger side circuit. You can also run this Y behind the transfer case (give yourself some room to service the transfer case later) and then into the exit circuit. 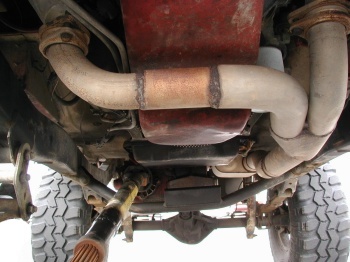 From there, run rearward to the catalytic converter and then the muffler, following which, you will arc the last section of pipe up over the rear axle and then straight out the back with the tailpipe. 2-1/2" diameter pipe is usually very adequate and will flow as much as you need. 3" is an option. There is no need whatsoever, in terms of the engine & transmission swap, to use a different crossmember than the factory versions. They are typically low profile and can easily be redrilled for a new transmission mount unit. Unless you are retaining an AX15, getting rid of the factory urethane mount and any ancillary bracketry with it is the largest favor you will do for yourself in this area. Go with a clean, simple, industry standard mount like the Novak #RMU. You may need some simple spacers. Box steel or aluminum pucks are useful here. Anything needing to be fabricated needn't be elaborate. Many people mistakenly think that a more powerful engine demands stronger-than-stock axles. This is not necessarily the case. The factory Dana 35 rear axle can withstand ambitious engines. Such is the case for the front Dana 30 as well. Whether your converted Jeep needs stronger axles is more a question of how you use them, and usually in terms of off-road considerations more than on-road use. This topic generally covers throttle, clutch release and transmission & transfer case shifter systems. As with many aspects of a swap, this can be a simple as the installer would like it to be. As nearly all modern Jeeps and GM engines use sheathed cable for throttle control. More Generation III engines use a throttle-by-wire, in which case you will use the GM pedal, and connect the wiring as per OEM. Hydraulic clutch release with a Chevrolet bellhousing is easy. See Novak's #HCR3 Clutch Slave Cylinder retrofit kit. Factory TJ brakes are usually very adequate for nearly all engine conversions. As a general rule, if the brakes were good before the swap, they will probably be sufficient after the swap. It is up to the individual doing the conversion to ascertain whether or not to upgrade the braking system depending on how the Jeep is to be used. Brake systems are out of Novak's scope, but there are companies and shops that deal with brake upgrades if the installer deems it. All in all, there is no change to your Jeep that is more exciting or beneficial than a powertrain conversion. Individuals have been swapping GM power into Jeeps for decades and they still occur with frequency and great success.